This book explores the evolutionary context of terrorism and political violence. While evolutionary thinking has come to permeate both biological and social-science theorising, it has not yet been applied systematically to the areas of terrorism and political violence. This volume seeks to do this for the first time. 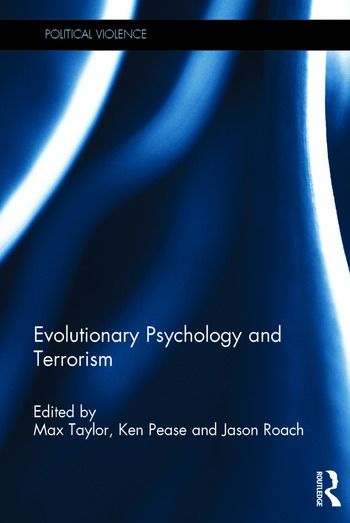 It presents a collection of essays on evolutionary psychology and terrorism, which encourage the reader to approach terrorism from a non-traditional perspective, by developing new approaches to understanding it and those who commit such acts of violence. The book identifies evolutionary thought as heuristically important in the understanding of terrorism, explores the key conceptual themes, and provides an evolutionary (and cross-species) understanding of the community-wide effects of terrorist attacks. The contributors bring forward innovative ideas and concepts to assist the practitioner, analyst and academic to better understand and respond to the threat of terrorism. In doing so this book challenges existing assumptions about terrorism and those who carry out such acts, in order to move the debate into new areas characterized by an emphasis on intellectual quality and rigour, an interdisciplinary approach, and a drawing together of theory and practice. The intention is to provide a sufficient discussion to enable the reader to both understand the relevance of evolutionary thinking to terrorism and political violence, and to appreciate the practical implications of conceptualising problems in this way. This book will be of much interest to students of terrorism and political violence, psychology, criminology and security studies. Max Taylor was until retirement Professor in International Relations at the University of St Andrews and Director of CSTPV (Centre for the Study of Terrorism and Political Violence). He is currently Visiting Professor at the Department of Security and Crime Sciences, UCL, London, and is Editor of the journal Terrorism and Political Violence. Jason Roach is Reader in Crime and Policing and the Director of the Crime and Policing Group, at the University of Huddersfield. Ken Pease is a forensic psychologist, former Professor of Criminology at Manchester University and Acting Head of the Home Office Police Research Group.